The recipes are clearly written; however, a cook will need a certain amount of intuitive skill to prepare them. Brown lists the ingredients precisely in grams and ounces (“100 g/4 oz tomatoes, diced”), but he also frequently instructs the cook to “add a portion” of that ingredient, leaving readers to work out what “a portion” means and when to add the remainder. Likewise, he uses cooking terms such as “sweat the onions,” which require some previous kitchen know-how. Because the cuisine may not be familiar to everyone, the cookbook would have been enhanced by a more personal, in-depth look at the recipes. 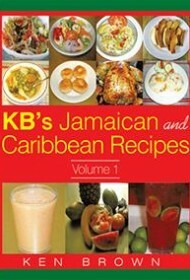 As it is, Brown is a chef of few words, devoting a few sentences here and there toward giving readers insider knowledge, such as noting that Jamaican breakfasts include “fried dumplings (Johnny Cakes), fried bammy (cassava bread), boiled green bananas, or roasted breadfruit.” In addition, cooks would have been better served with a glossary of food terms specific to the cuisine (e.g. “callaloo,” “chocho” and “dasheen’) at the end of the book, instead of the existing recipe index (which often gives the wrong page numbers anyway). Still the recipes are the heart of any cookbook and cookbook lovers will find plenty to choose from here: For the more adventurous, there’s “Goat’s Head Soup (Mannish Water)” that uses a goat’s head and feet, mutton tripe and stomach — a recipe even Brown warns “not everyone will like.” For the rest of us, there’s “Jam Fritters” and “Prawns With Sweet and Sour Sauce” to serve as an introduction to this tasty cuisine.